All our brass is solid brass, not brass plated. Its deep polished finish is left unlacquered so it will dull down over the years. 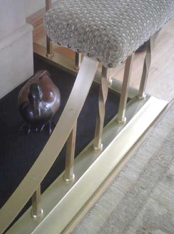 If you'd rather a low maintenance finish, then the brass can be lacquered to delay the tarnishing - but the lacquer adds a sheen to the metal. The fender seat shown left has rope twist uprights, round collars and deep buttoned black leather seats. 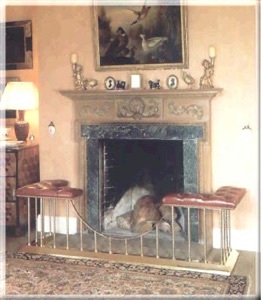 Its classic curved dip frames the fireplace, and allows access for cleaning and stoking. The base is available only in the formed style, for strength. For the uprights, choose from plain round, plain square or plain square with every other one twisted, reeded (fluted) and rope twist. The price of a brass fender seat varies depending on which extras you have (eg, deep buttoned seats, twisted uprights) and the size, but expect a bottom line, including vat and delivery, of around £1680. If shiny polished brass is not what you're after, consider having a brushed finish shown right. It's not pretending to be an antiqued finish, and the brass still looks new, but without the deep shine. The brushed brass is an extra £69. The antique brass finish gives the fender an aged look, to either a light degree or something a little more weathered. The process adds £252 to the price, and an extra week or so for delivery. There are examples in the album below. For an alternative to the brass base, choose a shaped oak base, with brass uprights. The oak is stained beautifully to a light, medium or dark finish. The album below illustrates some variations. Expect a price of £1512 including vat and delivery. Skim the albums below, click for larger pictures. 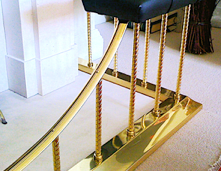 The albums show the polished brass finish, the brushed brass finish and brass uprights set into an oak base.